It was not realized at the time, but the 1992 introduction of the polymer-housed transmission line arrester (TLA) was clearly a game changer in the practice of lightning protection of transmission lines. Overhead shield wires had been the only cost-effective means of mitigating the effects of lightning until that moment. Since then, the TLA has shown its value not only in reducing lightning induced outages but also in numerous other power system protection, construction, safety, and operation scenarios. A TLA is manufactured and certified the same way as a standard arrester, but its application is different. A TLA is applied in parallel with transmission line insulators to prevent insulator back flashover. To mitigate backflash, the arrester conducts the lightning current from the down ground onto the phase conductor. This is quite the opposite of normal arrester installations. A back flashover is a flashover originating from the pole or the tower down ground that moves across the insulator onto the phase conductor, as shown at the top of Figure 2. This can occur during a lightning strike to the overhead shield wire, where the ground impedance is high. It is referred to as a back flashover since it is in the opposite direction of flashovers produced in a direct strike to a phase. The back flashover is usually followed by a standard forward flashover of the insulator, providing a path for power frequency current (fault) that requires a breaker operation to terminate. The mounting example in Figure 3 shows three methods that are used for mounting TLAs. An important consideration that must be made when using a TLA is lead management. Since disconnectors are used to isolate a failed arrester from the line, the line connected to the disconnector must not be able to touch another phase after it has disconnected. There are many options on how to do this. to an unshielded transmission line, a station class arrester may be required to handle the surge energy from lightning. 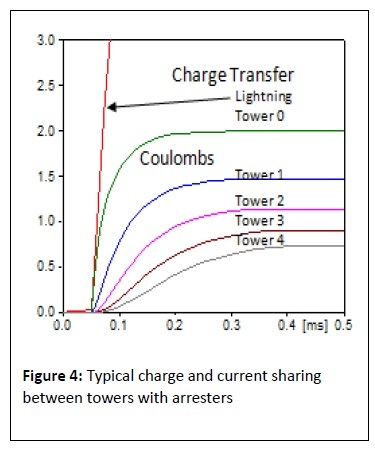 Figure 41 shows how the charge (in coulombs) is shared between arresters on a typical transmission line. In the model that produced the graph in Figure 4, the total strike charge was 16C at tower 0. Towers 1–5 are on one side of the struck tower, and there is the same number of towers with arresters on the opposite side. One of the biggest concerns of those using TLAs for the first time is their long-term reliability and maintenance. There was a time when gapped silicon carbide arresters had questionable reliability. However, in this mature MOV arrester era, reputable suppliers have consistently achieved arrester failure rates that are close to that of insulators. If your reliability experience is not in the 200 parts per million (ppm) range, you need to consider a different supplier. With regard to maintenance, there is none—simple as that. If you wish to monitor the TLA population, thermal imaging is recommended. 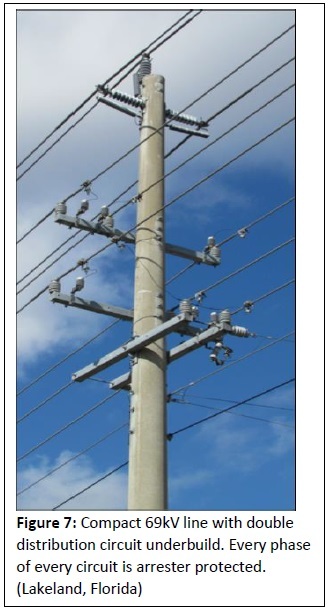 If your transmission line has less than 5 ohms of tower ground resistance or you live in a low ground flash density region or your lines are well shielded, and you have a lightning induced outage rate of zero, then you do not need line arresters. However, for the rest of you, the TLA can make a big difference in outage rates on your transmission lines. 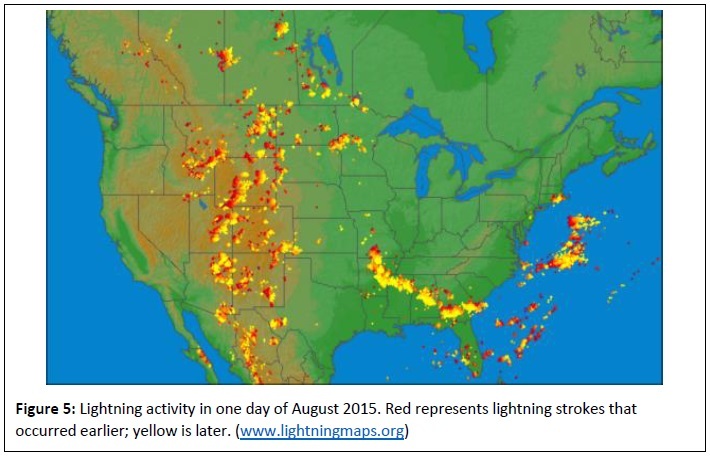 There are few places in the US where lightning is not a common occurrence. The map as shown in Figure 5 is a great resource to get a feel for the lightning hit rate in your area of interest. Vaisala is also an excellent supplier of lightning data that is used by many utilities. If you wish to improve the lightning outage rate of a transmission line, there are two ways to do it. The first and most often used is to improve the tower ground resistance. This is done most often since up until 20 years ago, it was the only option. For the past 20 years, surge arrester installation has also become a means to improve the lightning performance of transmission lines. In fact, with arresters, a transmission line can become virtually lightning proof. The term “virtually” is used because there is always a slim chance that lightning finds a way to cause an outage even with arresters. Sectionalized protection is a term used when protecting only a certain area prone to outages due to lightning. If this is the case, the surge arresters can be installed only in that area. The high outage rate can be reduced to zero by installing arresters in these areas. Common areas of high outage rates include mountain tops, dry planes, and rocky soil. The National Electrical Safety Code (NESC, IEEE C2-2012) specifies horizontal and vertical clearances of unguarded parts and clearance to live parts of extra-high-voltage (345 kV and above) power systems. Basic clearances are specified, which can be adjusted based on switching surge amplitudes. 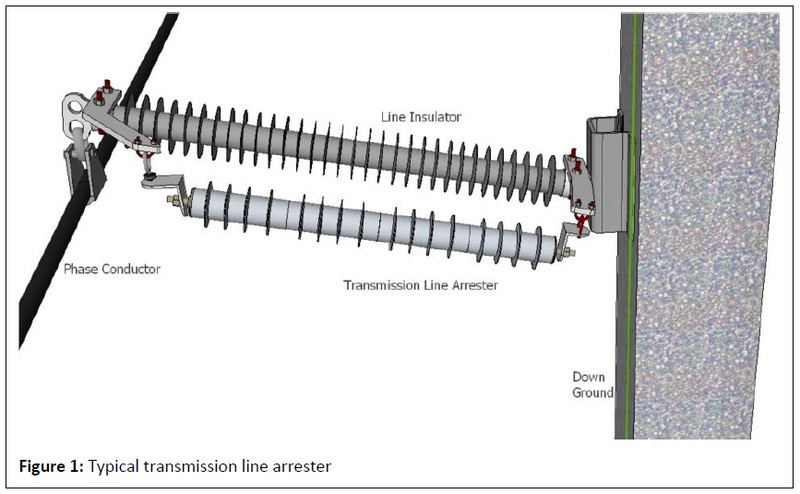 If line clearances are found inadequate to meet NESC criteria, TLAs can economically control the switching surge amplitudes with a few installations along the line. For example, on a 500 kV system, maximum crest operating voltage (line to neutral) is 449 kV. If the switching surge (line to ground) voltage is 808 kV, switching surge factor is 808/449.1 = 1.8 pu. In Table 124.1 of the latest NESC (IEEE C2-2012), clearances are given for switching surge factors ranging from 1.8 to 2.7 pu for a 500 kV power system. The clearance for a 1.8-pu switching surge max is much less than for a 2.7-pu surge. This can make a significant difference in the width of a right of way, saving thousands of dollars in the project. This is discussed in detail in an IEEE paper on this subject. A subtle but potentially significant benefit of using line arresters instead of an overhead ground wire is construction cost savings. Final report on NYSERDA project 28816 covers this topic in detail4. In the report, the cost savings for several different systems were investigated. 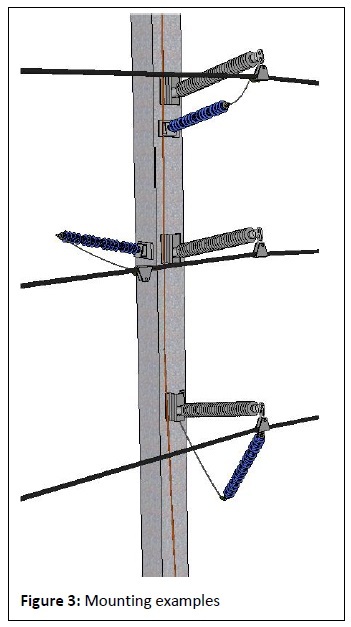 As shown in Figure 9, in every case, transmission lines with arresters in the place of OHGW cost less initially and going forward. Table XV of the report indicates that construction cost savings are between 1.8% and 5.8% of total cost of the line for various line-type studies. This is for installation of arresters on all phases of every tower that in effect makes the line lightning proof. 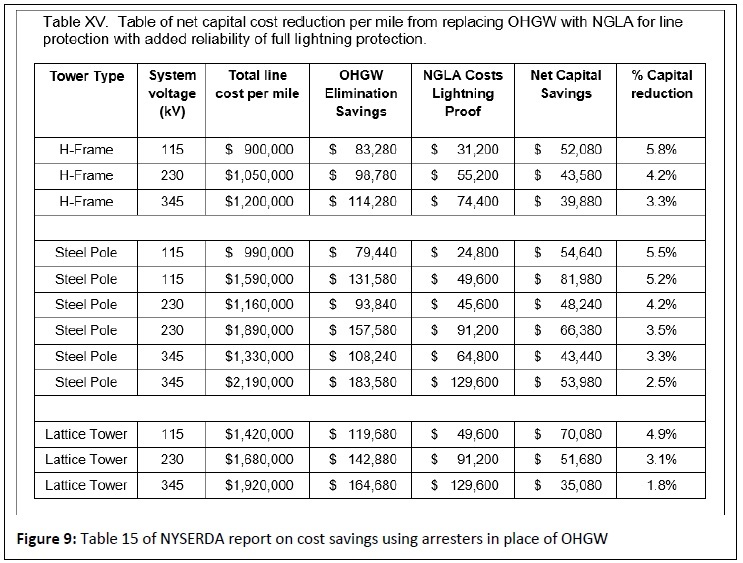 If only the top phase is equipped with arresters that are the equal of OHGW protection, the savings are even more. interrupt the current flow. Since breakers have a finite number of operations before maintenance is required, any reduction in the number of operations will extend the life of the breaker. Some utilities must deal with significant risk of lightning outages in the summer. For example, if a power source is a long distance from the urban center where most of the power is consumed, and if the transmission lines pass through high-lightning areas, the risk of a momentary outage can be very high. One means of mitigating this type of risk is to run local generators and depend less on the lower-cost distant source. If arresters are used on the transmission line in addition to the present OHGW, the probability of a lightning induced outage becomes zero. The cost of installing several hundred miles of arrester protection is very likely to be much less than the cost of running higher-cost local generators. This application of arresters can generate enormous savings for the end consumer and an equal amount for the utility. This application is more for new construction but could be applied to older lines if the OHGW should age out. It is a well-known fact that OHGWs can generate losses on the system if they are grounded at the tower tops. The losses are inductive in nature from the load flowing in the phase conductors. 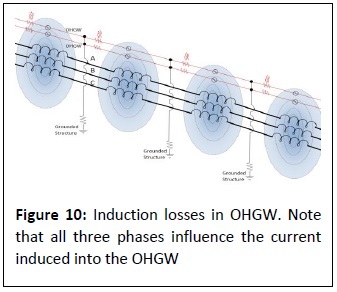 The closer the OHGW is to the phase conductors, the higher the losses. This loss analysis is covered in detail in a NYSERDA report.1 The losses are dependent on the type of line, number of shield wires, and the current load on the system. 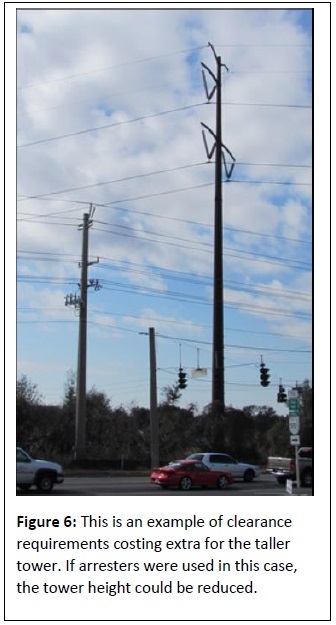 As you can see in Figure 11 for single-pole, two-circuit 115-kV lines, a lifetime savings of heavily loaded lines can result in $4.6 million per 100 miles of line. The TLA can improve power systems in many ways. It can not only can it make a line lightning proof but also lower construction costs, increase system reliability, reduce the size of a right of way, and many more applications. Those responsible for power system reliability or planning can make a significant difference when considering the possibilities offered by TLAs. This article was sponsored by members of NEMA Section 8LA. 1 Ceralink Inc. Reduction of Transmission Line Losses by Replacement of Shield Wires with Arresters. Troy, NY: New York State Enery Research and Development Authority, 2014. Protection, Nov. 9–13, 2009, Brazil. 3 J. Woodworth, “Lowering Losses on Transmission Lines with the Use of Arresters” (paper presented at IEEE T&D Conference, 2014). 4 Ceralink Inc. Reduction of Transmission Line Losses by Replacement of Shield Wires with Arresters. Troy, NY: New York State Enery Research and Development Authority, 2014.